Gold for China in the Women’s Individual Go as Yu Zhiying 5p defeats Korea’s Kim Chaeyoung 2p. Ranka takes a look at their exciting game. Check the game record for detailed comments by Michael Redmond 9p. The action began with Kim Chaeyoung making a very active extension on the lower side of the board (move 30). Compared to the usual three-space extension, this turned out to be an overplay that would decide the course of the game. In the trade that followed up to move 77, Yu allowed Kim to move out but took ample profit both on the right side and also at the top, giving her a territorial lead. Kim continued her active play by ignoring her weakness in the centre and shifting to the left side to build a moyo with move 78. This gave Black the opportunity to fight back and begin to surround White’s group on the right side. Up to move 99, White was in a bit of trouble, however Black missed a severe clamp and this gave White some chances to make the position more complicated. A difficult fight ensued, with both sides having to deal with their many weak groups under the pressure of byoyomi. Move 137 was an inaccuracy for Yu as this move does not give enough eyespace to her central group. White suddenly went for the kill with move 158 (Diagram 2). But the ensuing semeai was impossible to win and we can call this the losing move. 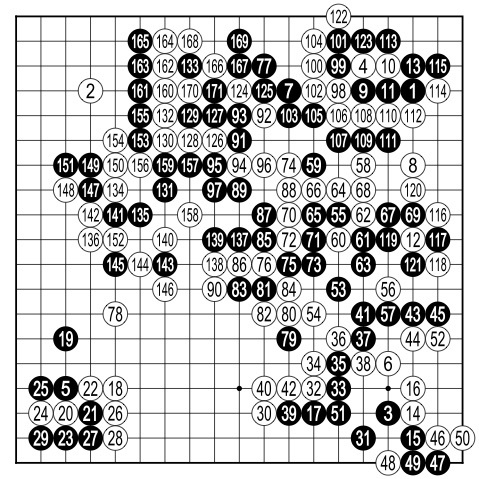 Instead of this all-out strike, the sequence shown in Diagram 3 is how Kim should have played and would have given White a promising position. Congratulations to Yu Zhiying, who remains undefeated in this year’s World Mind Games. She will be teaming up with Mi Yuting 9p for the Pair Go tournament, hoping for another gold for China.